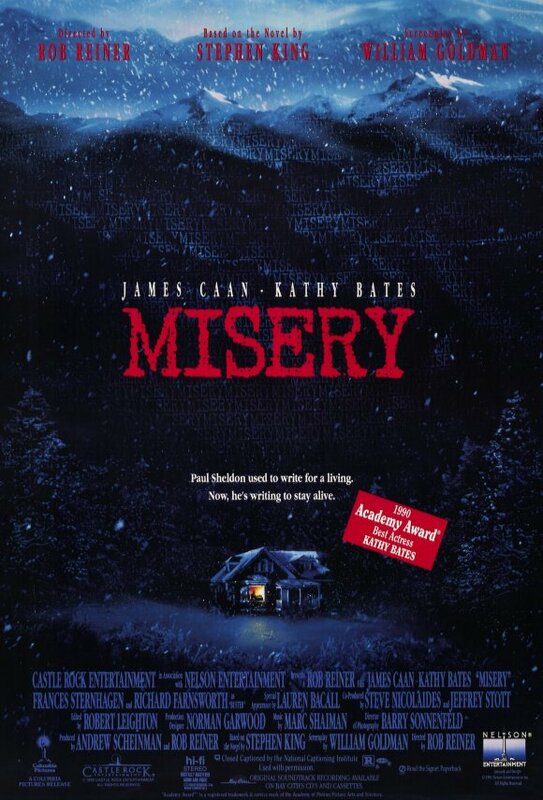 Tag line: "The Tide Has Come"
Based on a book by Stephen King, Misery stars James Caan as Paul Sheldon, a world-renowned author of romance novels who’s grown tired of writing the same old nonsense. So, he informs his editor, Marcia (Lauren Bacall), that he’s ending his popular Misery series, chronicling the romantic adventures of a young woman named Misery Chastaine, to instead tackle a personal project, one he’s been planning to write for years. After several weeks at his favorite retreat in Colorado, Paul heads to Los Angeles with a completed manuscript he hopes will usher in the next era of his career. Unfortunately, his trip comes to an abrupt end when, during a snowstorm, his car spins out of control and careens down a steep hill. Badly injured and trapped in the middle of nowhere, things look pretty bleak for Paul until a local resident named Annie Wilkes (Kathy Bates) happens upon the wreck, dragging him to the safety of her cabin. As it turns out, Annie is a huge fan of Paul’s Misery novels, and for a while, is also the perfect host, nursing Paul back to health and tending to his every need. But it isn’t long before Paul realizes Annie has no intention of ever letting him leave. Crippled and in constant pain, he must nevertheless find a way to escape the clutches of his ‘number one fan’. Kathy Bates is positively demonic in the role of Annie, a performance that won her both an Academy Award and a Golden Globe for Best Actress. Able to shift from ‘aw, shucks' fan worship to full-fledged psychotic at the drop of a hat, her Annie is one of the most unnerving characters you’re ever going to encounter. She’s completely unpredictable; there’s no way of knowing how she’ll react in any given situation, which makes every moment spent in Annie’s company unbearably tense. And man, was it tough to sit through that scene with the sledgehammer! Director Rob Reiner has explored a number of different genres throughout his career, from madcap comedy (This is Spinal Tap) to fantasy (The Princess Bride), coming-of-age (Stand By Me) to courtroom mystery (A Few Good Men), romantic comedy (When Harry Met Sally) to historical drama (Ghosts of Mississippi). With Misery, we can add “Thriller” to that list, and thanks to the performance of his lead actress, it’s a thriller you won’t soon forget. The hobbling sequence in this film is one of the few scenes I can't bring myself to watch again. It's brilliant and fantastic, but so gruesome I just can't see it again. Regarding the hobbling scene: Just be damn thankful it wasn't filmed as it was written!